Coding When High: Mind your language! 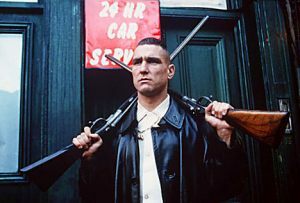 I find it hard to pick out a favorite quote from Guy Ritchie’s cult movie “Lock, Stock and Two Smoking Barrels.” It’s just chock full of great lines. Big Chris, despite the dubious London underworld he and his son inhabit appears to have aspirations for his son to remain reasonably polite. He replies, “Hey! You use language like that again son, you’ll wish you hadn’t!” Unless you’ve seen it, it’s hard to appreciate the energy with which that warning is delivered. Despite immersing myself in agile and Scrum and the language that comes along with that, and despite doing my best to socialize it over the last couple of years in my engineering group I think there are limits. Just as Big Chris doesn’t necessarily want his son to use the lingua franca of the underworld everywhere, I think you need to consider how far outside a development team you use agile and scrum vocabulary. One of the three legs of Scrum is transparency. But being too transparent isn’t necessarily a good thing (think body scanners in airports, for example). Maybe, if your entire organization has decided to operate using scrum, in everything from sales and marketing to operations, HR and accounting as well as engineering then you can happily talk about daily scrums, sprints, points and stories and velocity. But if they haven’t, then I think you have to balance carefully the education of those groups with whom you interact and the language you use. For me, there are three key pieces of terminology that I am, with hindsight, wondering about the wisdom of sharing widely. Yep, I don’t think we should be talking about stories. Now don’t get me wrong. That doesn’t mean I don’t think we should be using them. On the contrary, I’ve said it before and I’ll say it again, one of the most profound books for me as I was learning about agile was Mike Cohn’s "User Stories Applied." The concept is great. As a unit of work it’s perfect. For organizing requirements it’s helped tremendously. However, as a term to use with unsuspecting business stakeholders, customers and so forth I’m not so keen. Frankly it sounds rather ridiculous. I’ll stick with feature, thanks very much. Few people with practical experience of dividing your development up into fixed duration timeboxes is a bad thing. But do we have to call it a sprint? One of the things I like about Scrum is the fact that done right nobody’s having to dash like a lunatic to cram in all the last minute jobs to ship your product. Instead what we have when we do it right is a predictable, sustainable, humane way to utilize teams. Sadly sprint conjures up anything but that vision. These days I prefer to describe that we work in short two-week cycles, and if I need a short snappy name for them then iteration works just fine. I’ve pulled these two terms together as they really go hand it hand. At least, if you’re estimating stories in points but not measuring your velocity you might want to reevaluate what you’re trying to achieve. And these two are a little different for me than story and sprint. Whereas those are just unnecessarily goofy in everyday conversations with the wider business, and alternatives can serve us better, points and velocity need very careful handling, whatever you call them. Here’s the problem – points and velocity are a tool for the team to be able to evaluate their performance, to plan and make reasonably firm commitments. Stakeholders outside the team should be concerned more with what gets done and in what order. The Product Owner and team together can use points to respond intelligently to new requests, to switch things around, and figure out what fits where and what needs to get dropped. But start telling your stakeholders too much about average velocity, the points involved in a particular story and you inevitably risk them starting to focus on points rather than the “what should we do” and “what order should we do it in” issues. Perhaps in a really mature agile environment were a deep understanding of what points and velocity are for this wouldn’t be an issue. But early on in an agile adoption I think care is needed. I say keep the dialog with stakeholders confined to steering the product, negotiating the relative priority and let the team use points and velocity data to communicate what can be done for any given release. Put another way, what do you really want customers and stakeholders to concentrate on? The minutiae of your process? Or innovative product ideas and how they should be prioritized in the backlog?